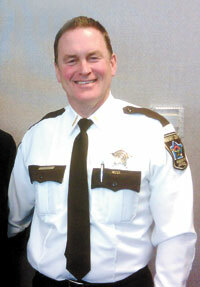 Sheriff Joe Hagerty of St. Michael is the 27th sheriff in Wright County. Hagerty began his service to Wright County in 1985 as a Deputy Sheriff. He was promoted to Patrol Sergeant in 1996 and Patrol Lieutenant in 2001. He was appointed Chief Deputy in 2006. He successfully ran for Sheriff in 2010, was elected and assumed office on January 3, 2011. Sheriff Hagerty was born and raised in St. Michael where he currently resides with his family. The Wright County Sheriff’s Office employs 139 full-time deputies. It provides contract law enforcement for 13 of the 16 cities in the county. The Wright County Jail employs 62 correctional officers operating a 224-bed facility. It was designed to be expanded to 360. Wright County covers 716 square miles and includes 18 townships and 17 cities and, has a population of 129,918. The county seat is located in Buffalo. reached by phone at (763) 682-1162, and by fax at (763) 682-7610.